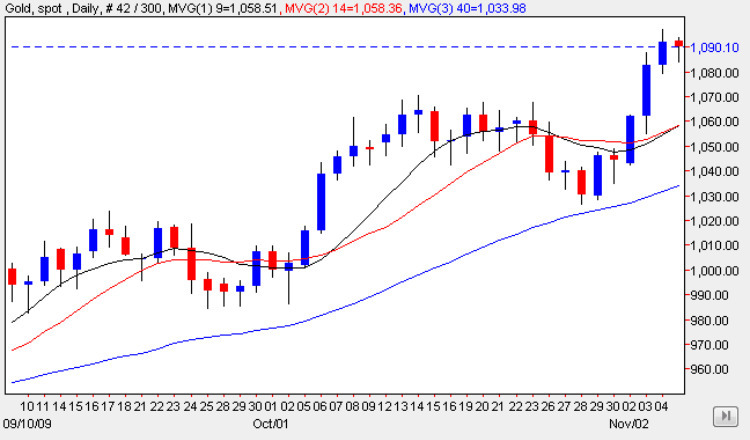 A day of introspection and quiet contemplation for spot gold prices yesterday, as the gold market paused for breath following its strong performance this week, ending the trading session with a narrow spread down candle, and with a small wick to the lower body. Clearly, given the strong bullish sentiment now evident in the market, it will be no surprise to see a minor pullback in due course, given the speed of the move, and as we approach the weekend gold traders will no doubt be taking some profit and squaring postitions ahead of the two day break. However, with all three moving averages pointing sharply higher and with the 9 day moving average now crossing back above the 14 day average, this is adding to the bullish picture, and with the longer term trend now forming into a series of higher highs and higher lows, there is no reasons to expect anything other than a long bull run for spot gold prices towards the end of this year and into 2010. If you are looking to start gold trading on the best trading platform, then try the free MT4 download which is available from this excellent gold broker by simply following the links.